While regular season games are a genuine privilege for UK fans the event itself is a move from the strictly business play book of the NFL’s sharpest minds – the executives who measure success not in yards and points but dollars and cents. My passion for the Bengals was fired as a 10-year-old attracted by the Tiger uniforms; black shirts and orange helmets with black Tiger stripes. It is a bond sealed by heartbreak – a last-minute Super Bowl loss in January 1989 orchestrated by the great San Francisco 49ers Quarterback Joe Montana. In short, my relationship with the Bengals is made of the time-honoured simple, sometimes insignificant, often intangible connections behind millions of sporting loyalties. But the opportunity to finally see my team play, just under a three-hour drive from my home, was due to modern football and its unquenching thirst for money. I’ve always followed NFL games via the television and I’ve been happy for Tom Brady, Adrian Peterson and Ndamukong Suh to remain stars of the small screen. 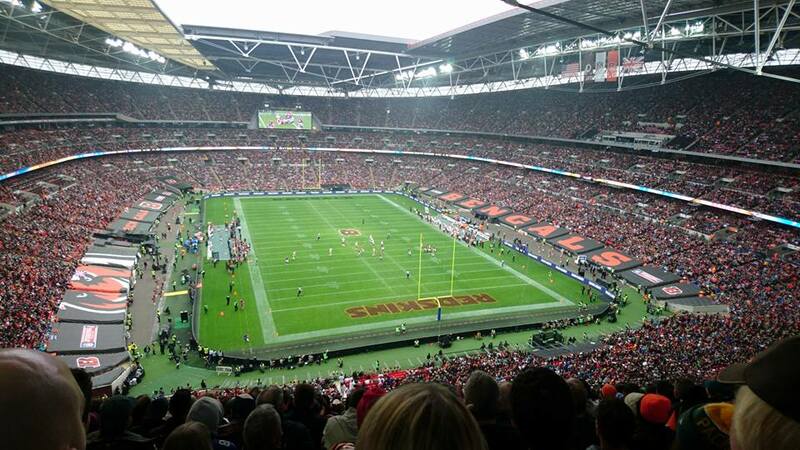 As a television viewer the addition of a live NFL game to free-to-air Sunday afternoon television has been the main benefit from the London games. 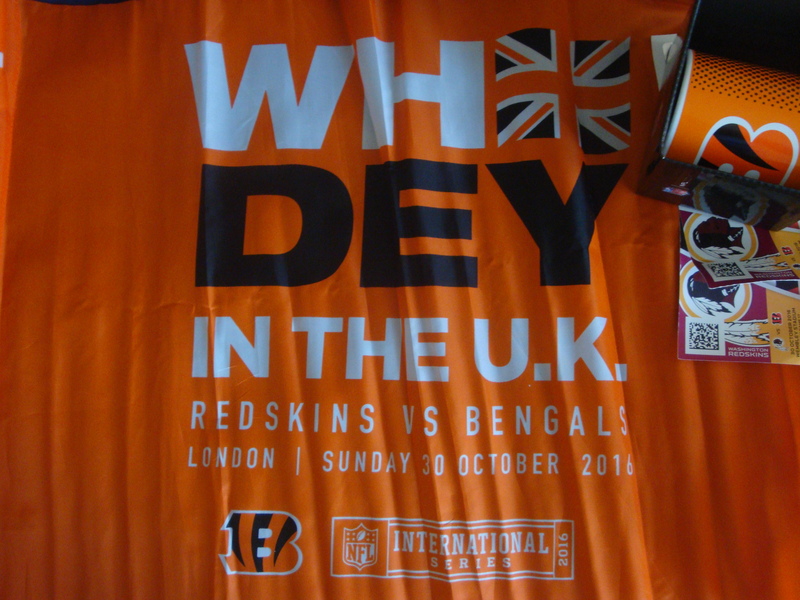 But as it dawned on me the league could soon dispatch the Bengals to London I began to eagerly await the international series fixture announcements. However just as I was excited that I would see the Bengals it has to be acknowledged that the majority of the team’s fans live in Ohio (and Kentucky) and they would see a precious home game sacrificed for the league’s commercial interests. Once the game was announced the official Bengals Facebook page revealed many fans were unhappy their team would have to give up one of only eight home games. I left a comment that I understood their frustrations, especially as many suspected season ticket prices were unlikely to reflect there would be one less game at Paul Brown Stadium. I was happy to receive replies from US fans that despite their disappointment they understood what it meant for supporters in the UK to see the Bengals. Of course by paying £40 for a ticket (around £50 in total with fees) I was buying in to the commercial agenda that has taken games away from traditional supporters. But staying at home in solidarity won’t immediately stop the NFL’s commercial juggernaut either, and I’m not sure I want to stop it. The NFL international series is a reality and while I understand the objections from US supporters the league’s expansion makes the NFL so much more accessible for European supporters who are just as passionate and knowledgable as those in America. I would hope that knowledge, not just of the game but the league, means other fans will view the NFL’s overtures to the UK with healthy scepticism. Fans don’t seem to have warmed to the suggested London franchise, with many insisting they wouldn’t swap their chosen NFL team. I hadn’t travelled to London to see established NFL teams play so rebranding the Jacksonville Jaguars as the London Queens is unlikely to prove attractive unless they are playing the team from The Queen City. The NFL’s relaxed attitude to teams – or rather franchises – upping sticks and leaving behind long-established fan bases with no regard for communities is a trait that doesn’t endear it to the UK and a sporting culture that values tradition. Many are unsure a London franchise is even practical and I suspect if a losing team struggled to draw sufficient support the league would soon start looking east to Germany where its short-lived NFL Europa league attracted healthy crowds. Cincinnati Enquirer sports columnist Paul Daugherty suggests in this column neither is there much enthusiasm for crossing the Atlantic among the Bengals players. When gameday finally arrived on Sunday, October 30 any concerns I had were put to one side as me and my brother headed to Wembley. 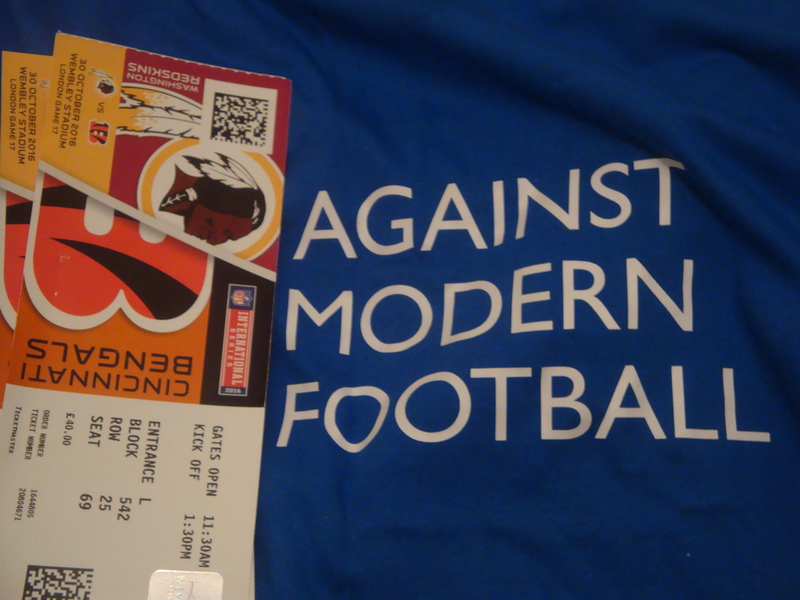 I had thought about wearing the ‘Against Modern Football’ t-shirt my sister had given me one Christmas. ‘Against Modern Football’ is the slogan of a loose movement in European soccer that seeks to strike back against the rampant commercialism that sees fans charged £4 for a regular coke, as they are at Wembley (that’s a mark up of about £3.98), or kick-off times arranged for the convenience of television companies with no regard for fans. With the NFL moving games to London to create a 9.30am east coast time slot in the crowded NFL Sunday TV schedule many might think American fans need to embrace the slogan and its anti-establishment sentiment. However I wasn’t sure if irony is the done thing at American sporting events. Despite being ‘America’s Game’ the NFL works on solid socialist principles that ensures revenue is spread between all 32 teams so money doesn’t translate as easily into on field success as it does in soccer. When fans know there is always genuine hope their team can challenge for the Super Bowl perhaps they are more willing to accept the sport’s commercialism? 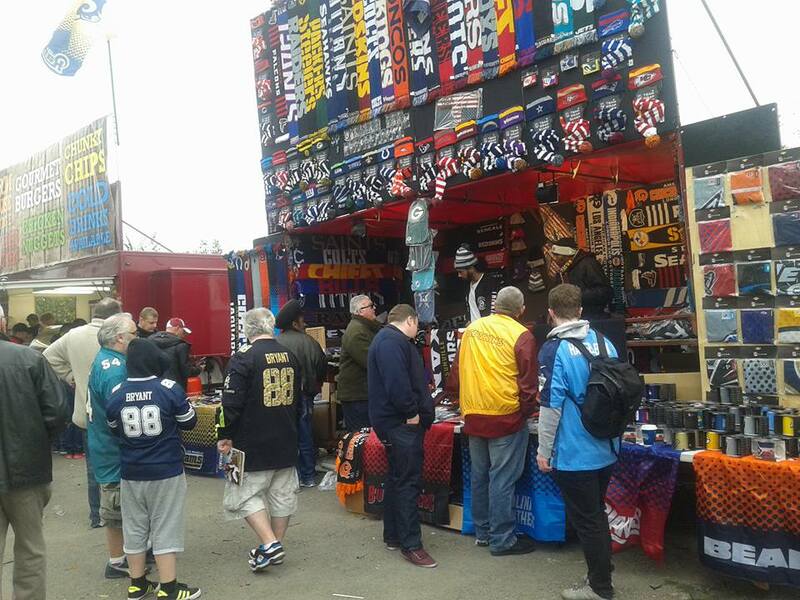 Choosing shirts is though clearly a big deal for many attending the London games which are famous for featuring crowds sporting jerseys from all 32 NFL teams. Others opt for their own Britball game jerseys – who knew Welwyn Hatfield has a team called the Mosquitos? Wearing an NCAA college football jersey seems to be the NFL London equivalent of sporting a Bundesliga replica shirt while a London Monarchs original laid a marker down to any johnny-come-latelies. But wearing a red, 49ers, number 16 shirt, with Montana on the back, to a Bengals game is just trolling. It was though pleasing to see so many Bengals jerseys as I’d feared the Who Dey nation could be outnumbered by Washington fans. The DC team’s Joe Gibbs era success coincided with football’s 1980s boom in the UK helping establish a solid supporter base. Some had clearly given no thought to their outfits judging by the number of men wearing ‘Indian headdress’ to the game oblivious to ‘Redskins’ being an inappropriate name for Washington’s football team. Inside Wembley the German market was evident. A group waving the black, red and gold tricolour appeared on the big screen while the three German guys behind us were enjoying Bengals Wider Receiver AJ Green’s performance and appeared to be having a good time other than when an American woman (in a Buffalo Bills top) came from another block to tell one to put out his cigarette. “It’s no smoking in here,” insisted the voice of self-appointed officialdom. Fashion choices aside though what could I learn from finally seeing the Bengals in the flesh? Not much I didn’t know it seems. Andy Dalton, for part of the third quarter at least, was talented, composed and capable of leading the Bengals to success. Tight End Tyler Eifert is an essential component of the offense and whatever AJ Green does can be undermined by defensive indiscipline. And with a minute remaining in overtime there was a fumble to underline why the team is so often, so cruelly written off as the Bungals. I’d never really thought I would see the Bengals in person, though for a while I did expect to spend every other Sunday, from September to January, in a different NFL stadium. But even before I began my youth football career as a Quarterback I’d accepted the NFL was looking further and further away. The NFL prides itself on being an entertainment experience, as famous for cheerleaders as it is touchdowns, but so many of its previous London games have failed to showcase the best on field action. Teams have so often looked jaded it’s hard to believe a London franchise could ever be competitive. The opening drive saw Washington make steady progress towards our top-tier end zone seats and open the scoring with a touchdown a very long way beneath our noses. 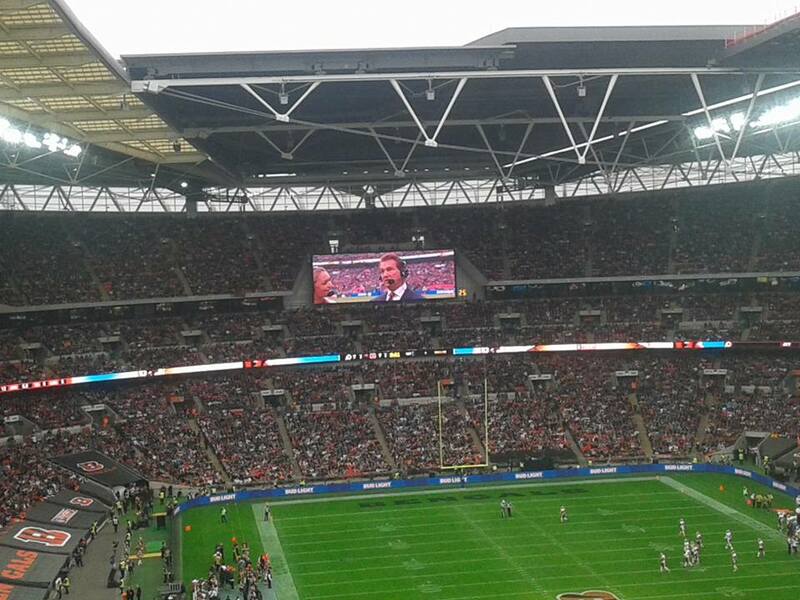 The Bengals responded by also scoring a touchdown on their opening drive, set up by an electrifying, long kick return, before the first half risked slipping into the sort of mediocre football that has been seen too often in London. In fact the highlight of the second quarter was a quick blast of Jamaican reggae singer Beres Hammond’s I Feel Good over the PA – a sharp contrast on a playlist that otherwise featured cheap pop songs and Macklamore. Off the field entertainment is important to the NFL – which obviously doesn’t like its No Fun League tag. Therefore a ‘Party Patrol’ – featuring women shooting t-shirts into the crowd and circus artists jumping and backflipping on giant springs – is dispatched at regular intervals to ‘thrill’ the crowd. But the biggest cheer during all of the intervals was for Bengals defensive lineman Domata Peko who, in a video played over the big screen, was the only player able to correctly explain soccer’s off-side rule. It seems the NFL thinks fans will value such officially endorsed fun over genuine, adrenaline fuelled, emotionally charged, impromptu celebrations from players, which will always draw a penalty and official condemnation from the league commissioner. Politics, gimmicks and occasions aside though Sunday was about winning and that’s something the Bengals really should have done and Washington so very nearly did. The NFL should be pleased after many lacklustre games in London – and in the league in general this season with the all important TV ratings down – both teams delivered great sporting drama, including coaching gamesmanship and a ‘simple’ missed kick at goal, in a game that went to the last second of overtime. All ‘five quarters’ as I’m sure someone has said. At half-time I feared I’d see the Bengals lose. Even late in the fourth quarter I thought the Bengals would secure the victory needed to move to four wins and four losses for the season but as I headed home I was just glad my day hadn’t been spoiled by a defeat and couldn’t agree that a draw – or in American a tie – is the most unsatisfactory result of all. This entry was posted in Sports and tagged American Football, Britball, Cincinnati Bengals, Gridiron, NFL UK, NFL Wembley, Washington Redskins, Wembley Stadium. Bookmark the permalink.